So, Daredevil #30 comes out next week and the preview for the issue was posted just a few hours ago. While it doesn’t give anything away regarding who will be Matt’s new law partner (something I will have reason to return to), Matt does make another very unusual acquaintance. What made me chuckle as I browsed these pages (specifically, this one) was the not at all subtle nod to an event in Matt’s life that took place a very long time ago. 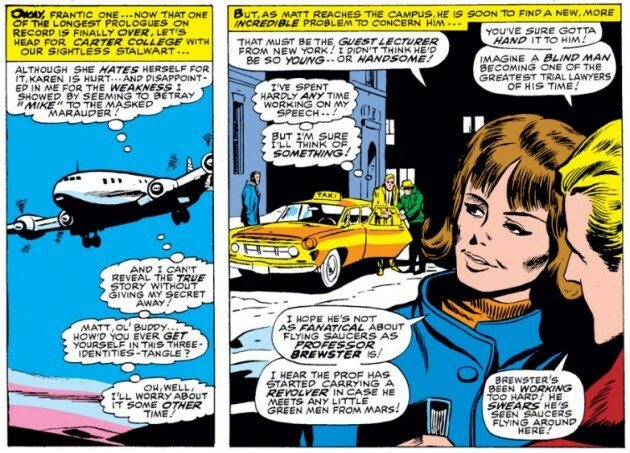 You see, in Daredevil #28, set in the middle of the Mike Murdock era, Matt decides to accept an invitation from a Professor Brewster to lecture at Carter College on the rather unusual topic of aliens on Earth. Specifically, how these would-be visitors would be protected by the legal system. Despite the fact that Matt doesn’t seem all that well-prepared, he manages to impress with his skills as well as his good looks! 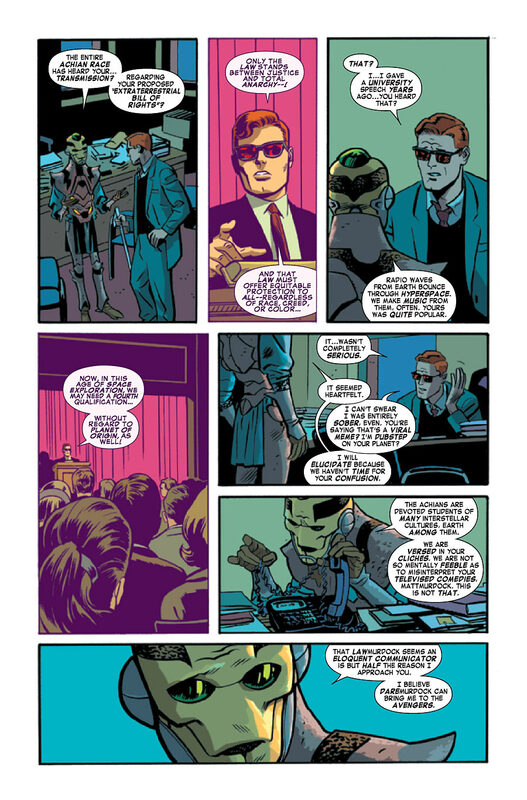 Finally, we see Matt giving the actual lecture, a scene that is very faithfully rendered by Chris Samnee and Javier Rodríguez in the Daredevil #30 preview. Seeing them pay homage to these original panels by Gene Colan was a real treat! Both versions have Matt look as if he shares more than an ancestral home with the Kennedy clan, and he looks decidedly presidential behind that podium. 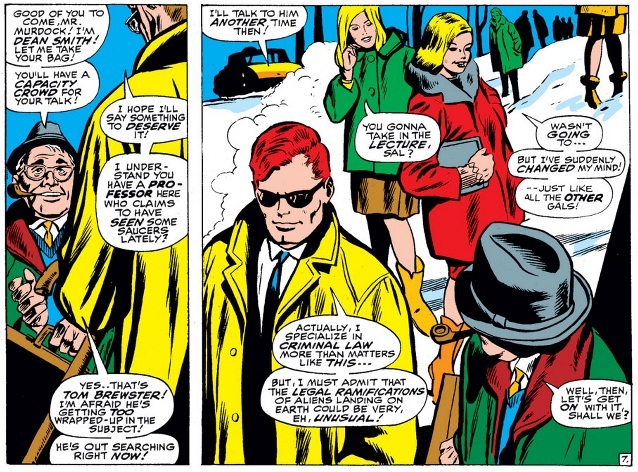 If you want to see more panels from Daredevil #28, I also suggest you check out these two previous posts: “What have the kapitalists done to us?” and “Wacky power #8 – Daredevil “senses” something (again)”. From what we’ve seen on Daredevil #30 so far, I really liked what Mark Waid and the rest of the team have done to bring what is really one goofy Silver Age romp of a story into current continuity in a way that works (especially in an issue that actually features aliens). This is how it should be done. It’s a fantastic treat for completist fans while also poking some gentle fun at the original story by Stan Lee and Gene Colan. 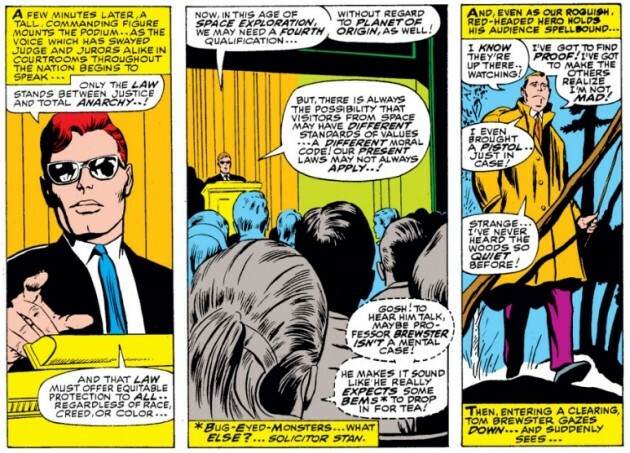 Though in Stan Lee’s defense, even the original story has Matt viewing the topic of his lecture with a sense of humor. I can’t wait to see how this one plays out! I appreciate your site! Fascinating and insightful posts and so original! I am following yours now!